Happy Friday, Welcome to the Great Impressions Blog. 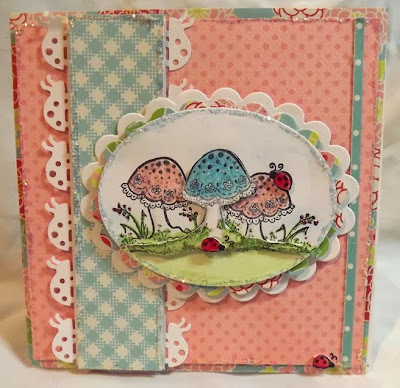 Today, I want to share a card using a very fun stamp, Lacey Mushrooms F399. This stamp is so much fun to color and can be colored so many different ways. Today, I colored it using a pastel palette, but I'm wanting to color it with some traditional red mushroom caps as well. For this card, I colored the mushrooms twice and popped the mushroom in the forground as well as the two lady bugs. I added an extra ladybug I cut out to the bottom of the card just for fun. I also used a fun border punch with ladybugs to echo the buglets in the image. All the mushrooms have been covered with sparkling glitter as have the edges of the different layers. I used some green glitter for the grass and a little pink for the tiny flowers growing around the mushrooms. Thanks for stopping by today. I'll see you again next Friday, but do not wait that long to take a peek back at the blog. We have lots of talented card artists waiting to share some wonderful inspiration with you. OMGosh, this is just darling. would definitely like to have this stamp. :D I love the way you colored it, so pretty. This would make a cute baby card. What an adorable card! I can see many uses for that stamp!